International students come to Australia from all over the world and find it a very attractive country to live, study and work in. Australia is a top destination for students mainly because of stable and open economy, attractive career choices and universities, highly rated infrastructure, multicultural society and beautiful landscapes and English language . Australia offers an high quality life style that many international students look for. Learn more about the student visa (SC500). 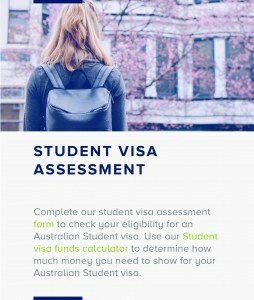 International students aiming to study, work and live in Australia after their studies should firstly apply for a Australia Student Visa to come and study in Australia. 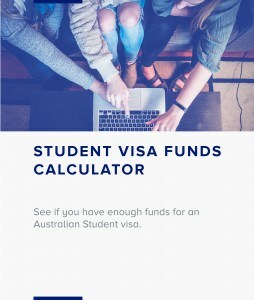 After 2 years of studies in Australian universities/ Vocational schools/ colleges offering higher education (and CRICOS approved), an international student could be eligible to apply for an Australian post study work visas under subclass 485. An Australian post study work visa may issued for varied time periods depending on your qualification. The student can then look for a permanent residency pathway in Australia if they meet the points test and other eligibility criteria. Alternatively if they have an employer willing to sponsor them for a TSS visa or the permanent ENS 186/RSMS 187 visa. If applying through General Skilled Migration, the applicant must have a positive skills assessment from the relevant skills assessing authority and have an occupation that is listed as eligible for the visa type. An important thing to note here is, your study area and your nominated occupation must match even though in some cases relevant work experience may substitute for the formal qualification. Please note is the occupations list changes often and according to the needs of the economy and labour market. How do you know which occupation is highly in demand and is likely to remain on the long term occupations list? Generally the joboutlook website could tell you the prospects of a profession and where there is a shortage of workers in Australia but that is not how immigration occupation lists work. This post contains an approximate list of courses you could to consider. We strongly suggest you contact us for a consultation to make an informed decision. We can also assist you with your enrolment to your course of choice. Meet the Australian Study Requirements: Generally, the criteria for is to study in Australia for a minimum of 2 years (closely related) but this may vary depending on your course of study or level (vocational or higher ed). The occupation you choose must ANZSCO Job Descriptions: If you google ‘anzco position descriptions’ you will see certain jobs have required fields of study at either higher education or vocational levels. To qualify for these jobs you must meet these educational requirements. Apply for a visa within 6 months: You should apply for PSWV 485 visa within 6 months of completion of your studies. CRICOS approved study program: Your course of the study should be on the CRICOS list of courses. Reports are available which provide information for the child care cluster. Reports are available which provide information for the construction trades cluster. A research report which provides a national overview of the labour market is available for the electrotechnology tradescluster. Reports are available which provide information for the engineering professions cluster. Reports are available which provide information for the engineering trades cluster. A research report which provides a national overview of the labour market is available for the food trades cluster. A research report which provides a national overview of the labour market is available for the health professions cluster. Reports are available which provide information for the nurses cluster. A research report which provides a national overview of the labour market is available for information technology professions. A research report which provides a national overview of the labour market is available for resources sector professions. Reports are available which provide information for the teachers cluster.